2010 Update: This book is now out-of-print, but the author has written some new books on Chinese painting. I really enjoyed this book, but a lot of that has to do with the business that I am in (selling Asian artwork). 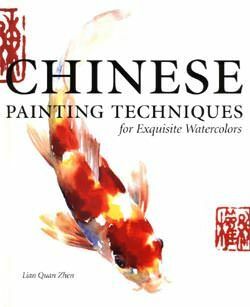 If you are an aspiring artist, interested in learning Chinese techniques for creating animal paintings, this is the book for you. The illustrations are great. Most of the pictures in the book in in full color and very detailed. The first chapter, CHINESE PAINTING BASICS helps you get started with the right materials, paints, brushes, and other equipment. You'll find in the remaining chapters, techniques for painting cranes, eagles, peacocks, chickens, fish, crabs, frogs, and other wildlife. Note: If you are looking for a guide to paint Asian landscapes, people, or calligraphy, this is not the book for you. This book really focuses on Chinese animal paintings. The author is always careful to include notes and diagrams about composition and ensuring balance in your artwork. He also keeps it interesting by adding little tidbits about the historical significance of a certain technique or composition. A few anecdotes about his experience teaching westerners about Chinese art at the University of California Berkley are also included. But the main content stays on the subject of teaching you about the Chinese way to paint. For the size of the book (144 pages) the author packs it full of good information. Someone with a basic background in fine art interested in expanding into Asian styles and techniques of creating both watercolor and other types of paintings. Anyone with a keen interest in Asian art that wants to know more background about how these masterpieces are created. This book costs less than $16 on Amazon. The book is clearly written and easy to understand. Techniques for painting some key animals of Chinese culture are not included (dragons & tigers). Also missing are landscapes and figures (people). I think it's good that it stays on the subject of painting animals, I just think the word "animals" should appear in the title since that is the true subject explored in this book. If you have never studied Chinese, you can ignore this comment. Not a big deal, but the author uses Wade-Giles (the way to Romanize Chinese words still popular in Taiwan and Hong Kong) instead of Pinyin (the Romanizing scheme used in Mainland China, and the official technique of Chinese transliteration according to the U.S. Library of Congress, also used in most colleges and universities around the world that teach Mandarin Chinese). I am a little surprised by this, since the author is actually from the mainland. It just makes you guess at some of the words if you've studied any Chinese. "Xuan" paper becomes "Shuan" paper, The "Song" Dynasty becomes The "Sung" Dynasty, "Guangdong" becomes "Canton" etc. Detail-style paintings show a lot of small details. For example, in bird and fish paintings, feathers and scales are clearly depicted. Artists handle their brushes carefully and slowly, and the brushstrokes are smaller and more uniform than in other styles of painting. In addition to ink, vivid and intense colors are also used. Artists use surfaces that do not absorb water, such as alum rice paper and alum silk. 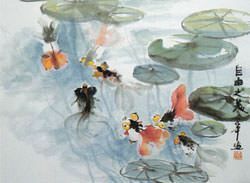 Detail style is the basic training for Chinese painting students. It teaches them to manipulate their brushes to acquire proper strokes, to observe and analyze details and to use colors. Also known as scholar style, this type of painting is strongly influenced by Chinese calligraphy and poetry. It remains the dominant style since its full development during the Sung dynasties. According to scholar-style painting theory, poetry, calligraphy and painting (the three perfections) are inseparable. A great artist should master them all. Obviously, this style is a combination of the detail and spontaneous styles. Some artists like to paint floral-bird paintings in this style. The paintings are not exactly equally half of each style. In most cases, the focus objects are in detail style and the others are in spontaneous style. 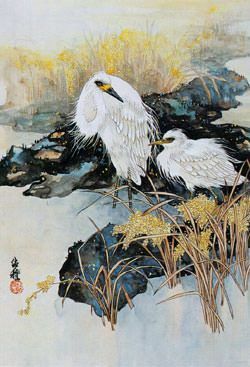 This typical detail-style painting depicts small details, such as the egrets' feathers and individual rice grains. The objects are painted with outlines and then filled in with colors. This spontaneous-style painting shows no small details. The brushstrokes are not uniform as in the detail-style painting, and the variety of strokes suggests texture and movement. Notice how the tails and fins of the goldfish are defined by wide brushstrokes rather than outlines. This is an except of Chinese Painting Techniques - for Exquisite Watercolors by Lian Quan Zhen used in conjunction with this book review.